This scenery, situated in Florida USA, is developed by NAPS. It’s one of their most detailed airports by NAPS. Sarasota–Bradenton International Airport (IATA: SRQ, ICAO: KSRQ, FAA LID: SRQ) is in Sarasota County (terminal) and Manatee County (airfield), Florida. Owned by the Sarasota Manatee Airport Authority, it is three miles north of Sarasota (Sarasota County) and six miles south of Bradenton (Manatee County). The National Plan of Integrated Airport Systems for 2011–2015 called it a primary commercial service airport since it has over 10,000 passenger boardings per year. Federal Aviation Administration records say the airport had 657,157 enplanements in 2011, 2% less than in 2010. Most airlines refer to the airport on maps and flight status displays as just “Sarasota”, the more widely known city. 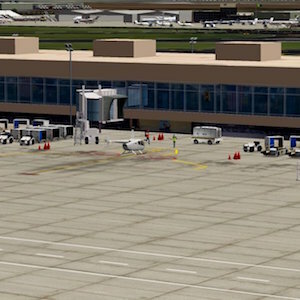 The airport is referred to locally as “SRQ” (the airport code). Much of the airline service occurs during winter and spring, as the area is a tourist destination and home for snowbirds during winter and spring. The airport’s IATA airport code, “SRQ”, is used as a general nickname for the city of Sarasota and Sarasota area, as exemplified by media outlets like SRQ Magazine, WSRQ radio, and numerous local businesses in the area that include SRQ in their names (Courtesy of WikiPedia). Thank you Nicolas, Org, Angelique, X-Plained. – Animations, amazing new .lin files, including tarmac edges & roads, etc. – With some of Marc Leydecker’s © objects. And what’s new with version 4.0? New aircraft traffic plus static animated aircraft plus ground vehicles traffic plus buildings upgrades plus new buildings plus new animated objects, and finally plus attention to details.